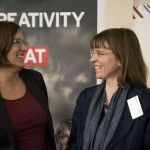 The British Council in Germany, in cooperation with the Centre for British Studiesat Humboldt University Berlin, organised its 31st Literature Seminar in late January (link to the event’s website). 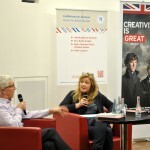 Readings and talks with contemporary British authors are at the heart of this event. 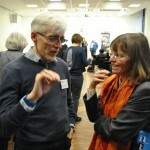 But the highlight for many participants is the workshop session on the last morning, where authors and participants get together in small groups for workshops ranging from creative writing to exchange talks about how to revolutionise the literary field. 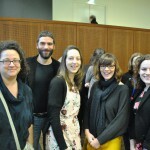 This year, Jake Arnott, Sophie Hannah, Philip Kerr, Val McDermid, Bethan Roberts and Kate Summerscale joined the seminar that was chaired by Professor John Mullan (UCL). 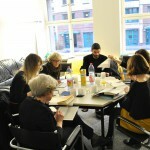 On the first evening, the Literary Field Kaleidoscope was formally launched. 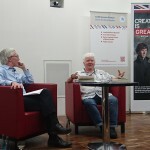 A central question of the seminar was whether we are currently experiencing a “New Golden Age of Crime Writing”. During their interviews as well as the panel discussion, the six authors approached this question with mixed results. 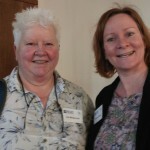 Val McDermid questioned whether one could talk about a “new age”, if nobody has an answer to the question when this new age has started. And most of the authors seemed to agree that part of the buzz about this alleged new age was due to the fact that “column inches need to be filled”. Crime writing has had a long tradition in the UK albeit under different names. The authors disagreed whether the “crime novel” label was still useful. Some rejected all labels and categories as rather patronising to the reader and limiting to the authors and publishers, others acknowledged the label’s usefulness in drawing in people who are intimidated by categories such as “literary fiction” (who came up with this label, I sometimes wonder). In any case, crime fiction is fashionable at the moment and BritCrimeLit sells. 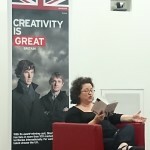 Not surprisingly, the panellists all stressed that crime fiction is no longer seen as inferior to “literary fiction”. Many acclaimed crime novels seem to support their point. The presence of crime series on TV was also commented on, but the only thing I would like to stress is an opinion I share with Val McDermid, i.e. that crime fiction on TV is at its best when it does not attempt to adapt a novel for the screen but was written for this medium in the first place. 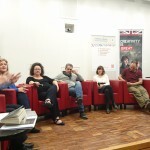 And while one of the authors bemoaned a lack of new talents (reference point: big publishing parties), others on the panel regularly encounter new interesting writers at literature festivals, such as the Crime Writing Festival in Harrogate (link) or Bloody Scotland (link) in Stirling. 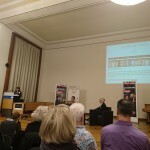 With “Tartan Noir” the authors brought the audience’s attention to relatively recent developments that are closely connected to political developments such as devolution and feminist endeavours. In this context, authors “bring murder out of the drawing room back to the streets“ and create characters that defy (gender) stereotypes to “make it more than just a puzzle”. So if one understands the notion of a “Golden Age” as a rich and diverse spectrum and as the ability to continuously reinvent the genre, then yes, most people at the seminar seemed to agree that we’re living in a “New Golden Age of Crime Writing”. Last, but not least, we also had a closer look at the changes in crime writing conventions. All authors seemed to enjoy playing around with conventions, testing their limits (not just in their writing, but also when it comes to the questions whether one must read at a reading…). Some of the most obvious differences to the conventions at the time of Agatha Christy are that the characters – above all the lead inspectors – show much more development than Miss Marple or Poirot ever did. And explicit, omniscient narrators who don’t even attempt to disguise their storytelling are also not fashionable any more. All in all, conventions have moved quite far away from the ten rules of the “Detection Club“ at the beginning of the 20th century (link to the rules), but above all, there is no shared agreement any more. Many authors, but not all of them, think a body is an indispensable element of crime fiction, as well as some extent of a resolution in the end. 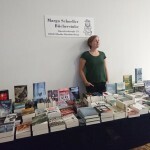 Despite all this increased flexibility and playing around with conventions, there is still such a thing as readers’ expectations – and all participating authors seemed to agree that you would not want to disappoint them completely. 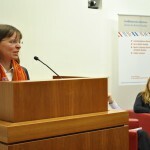 In the end, all authors at the seminar confessed they were enthusiastic readers themselves. As Val McDermid put it: “The way you learn to write is through reading.“ And even if not all of the seminar’s participants are going to aim for a crime writer’s career, I think it’s fair to say that we all went home with much longer reading lists that before.